Have you ever wondered why people would pay a small fortune for Hermès products? Or why do Birkin bags command years-long wait lists? Or why do their stores carry this mystical air of timelessness? 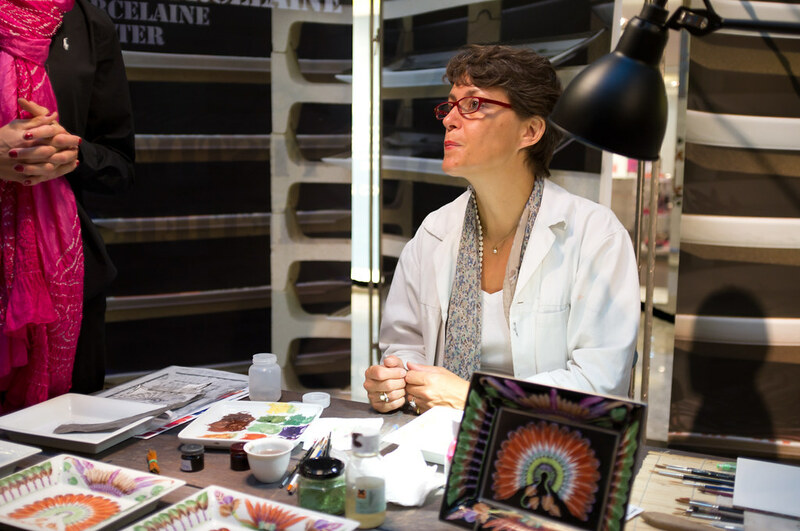 The Hermès Festival des Métiers (Festival of Crafts) is an extraordinary experience for anyone who appreciates the classic design and philosophy of excellence that drives Hermès. This is the first time the Festival has traveled to Asia and Singapore is very fortunate to be the first stop. 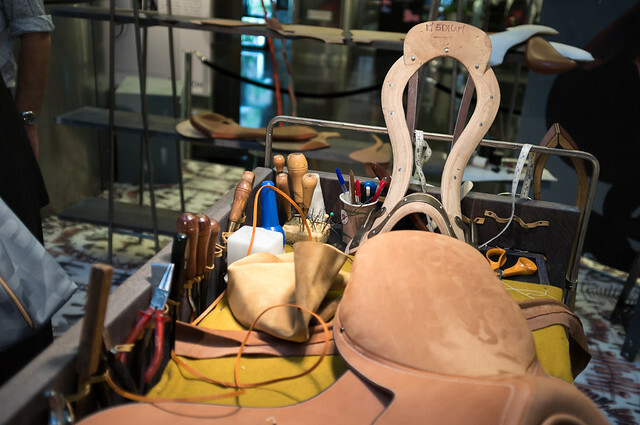 Located at the Main Atrium of Paragon Mall at Orchard Road is a little exhibition with eight stations – each featuring a craftsman/craftswoman demonstrating the creation of some Hermès products. 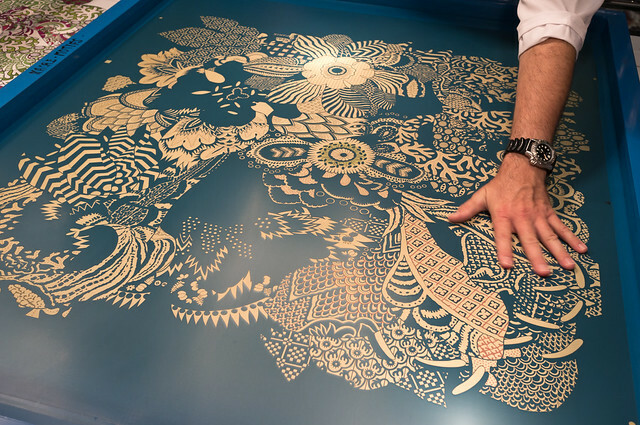 At the Silkscreen Printing station, a craftsman demonstrates how each silkscreen, one for each colour, are precisely aligned and printed onto silk. This station is described as a mini production line to create two pieces; the actual production line does hundreds of scarves at any time. 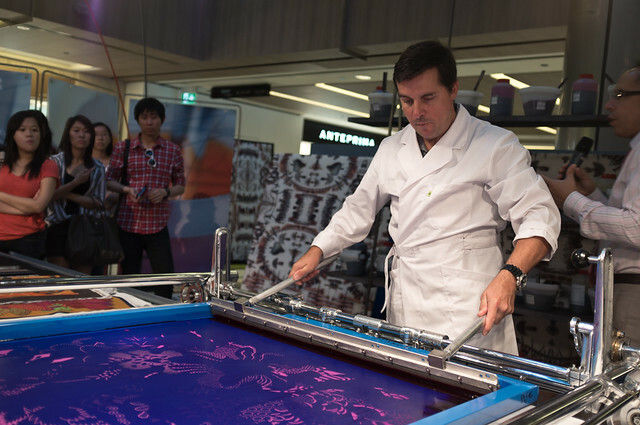 Another Hermès staff was around to describe the process of creating a scarf. 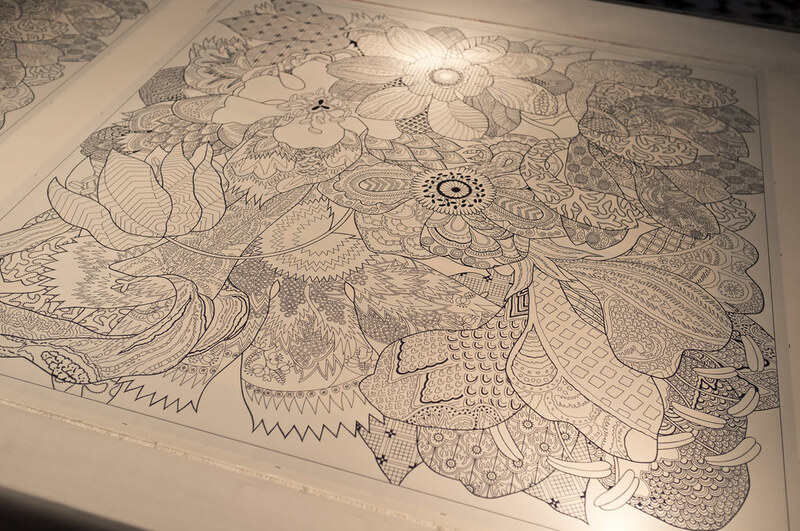 It takes about two years, from conceptualising the design – all the way – until it reaches the boutiques. 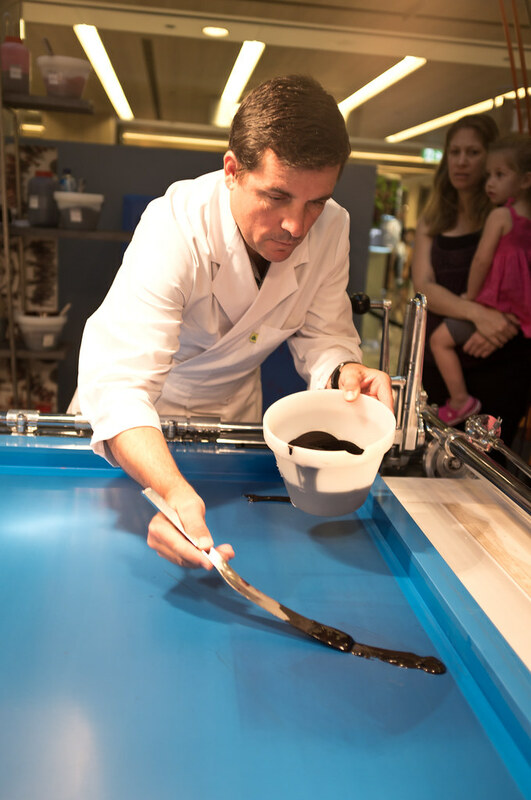 Hermès rears their own silkworms, produce their own twills, mix their own dyes – basically everything. Silk scarves are produced in Lyon, France, known for its history in silk industry. Each scarf design has about 10 variations in colour. 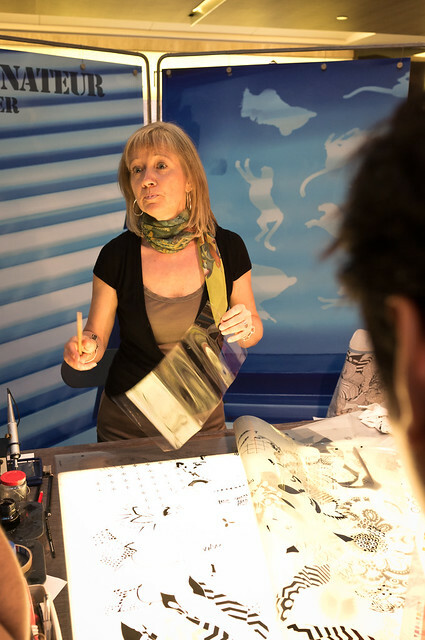 In the case of design, the staff explained that Hermès receives artwork from designers all over the world. Due to the long production process, the designers need to think forward at least two years in advance. In an actual production line, printing is just one part of the long process. After the silk has been meticulously coloured, they are left to dry for a few hours. Then, they are taken to a steam bath to lock the colours into the silk fibers, and repeatedly washed in a special way to release the gum in the dyes to make the silk softer. The scarves are then coated with a protective finish and sent to craftswomen for hand-rolling and hand-hemming along the edges. 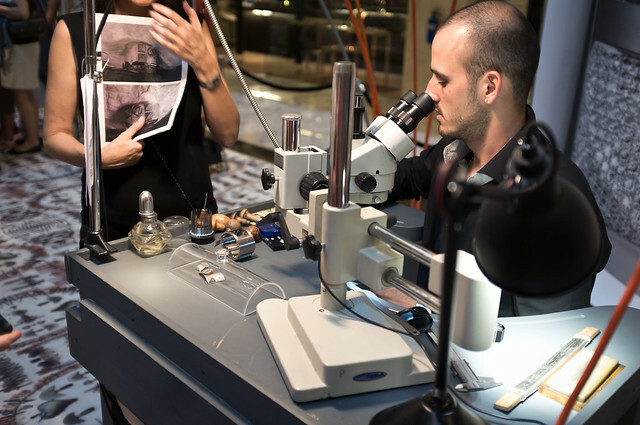 The staff emphasized that perfection and quality is everything in Hermès – if a print is misaligned even by a hair, or a tiny thread of silk is not in line, they will be regarded as imperfect and will be destroyed. They would rather destroy an imperfect product than to present it to their customers. 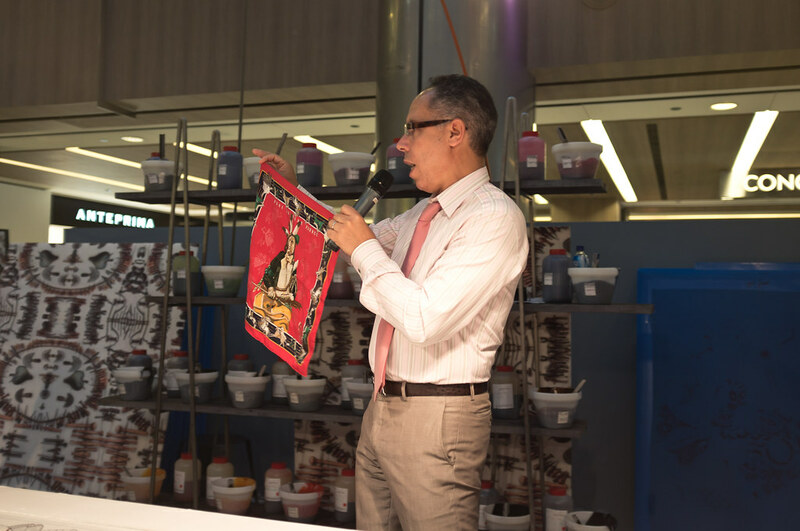 The staff also revealed the most complex scarf created by Hermès. 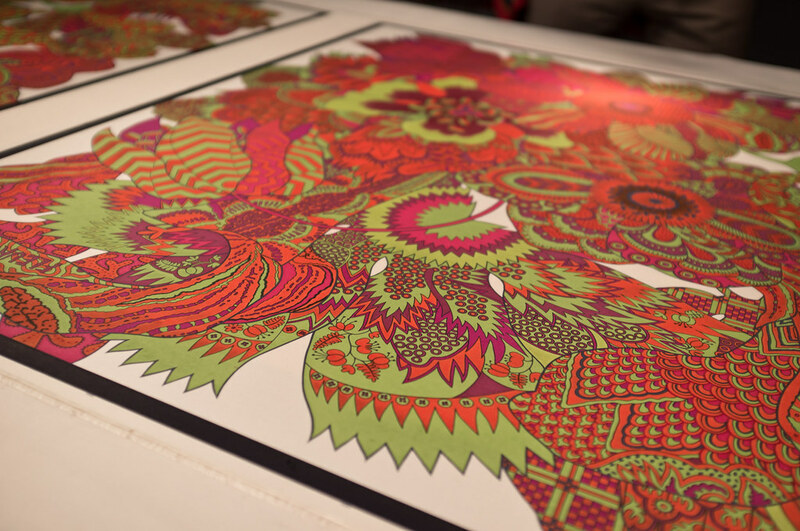 It is called Cosmogonie Apache and requires 45 silkscreens to produce. 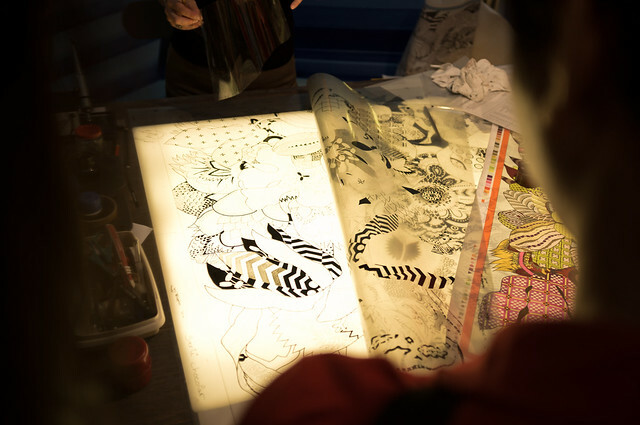 You can read the story behind the design and see how 45 screens are used on this page by Hermès. He also showed his own (smaller) Pochette scarf that he bought more than 10 years ago, but still looks and feels the same as its first day. After standing around the station for almost an hour, I observed the entire process of printing the Fleurs d’Indiennes (Indian Flowers) design onto silk. 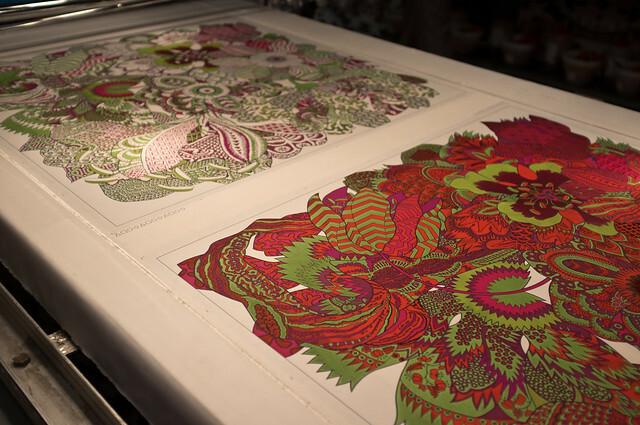 Unfortunately, one of the last silkscreens was damaged from an earlier demonstration and hence the background colour can no longer be printed. 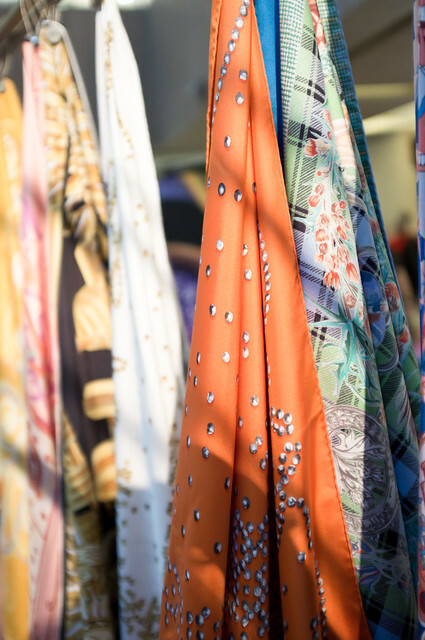 Two rows of shelves can be found near the printing station for visitors to get up close with the Hermès silk scarves and see/feel the details for themselves. The most important part of silkscreen printing are the screens themselves. 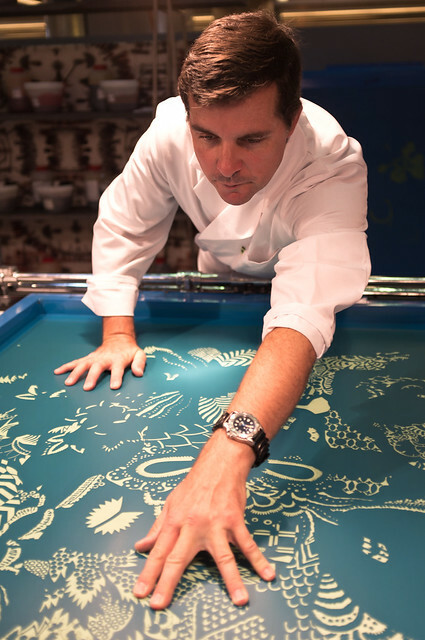 Artists design the artwork, but Hermès artisans will need to engrave the silkscreens by hand. The same silk used for scarves are also used to make ties. 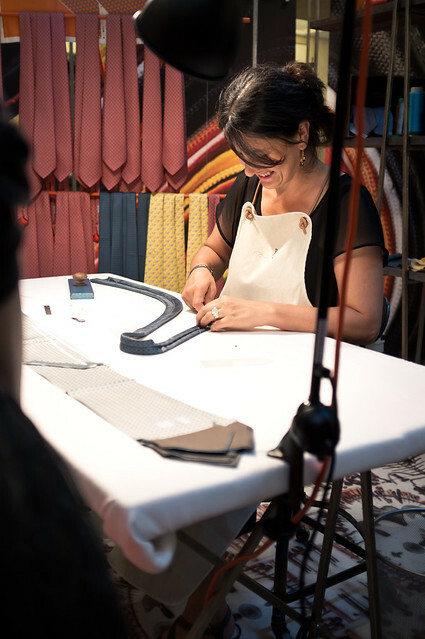 Over here a craftswoman demonstrates how the twills are rolled, folded and stitched into ties. 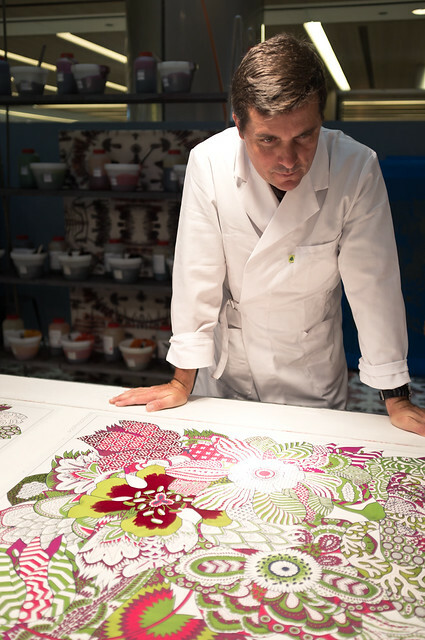 The fine china and porcelain items that Hermès is well known for are also hand painted. The Collier de Chien, also known as “Dog Collar”. Commonly made with leather and palladium hardware, the bracelet was recently released in a larger size for men, called Collier de Chien Homme. 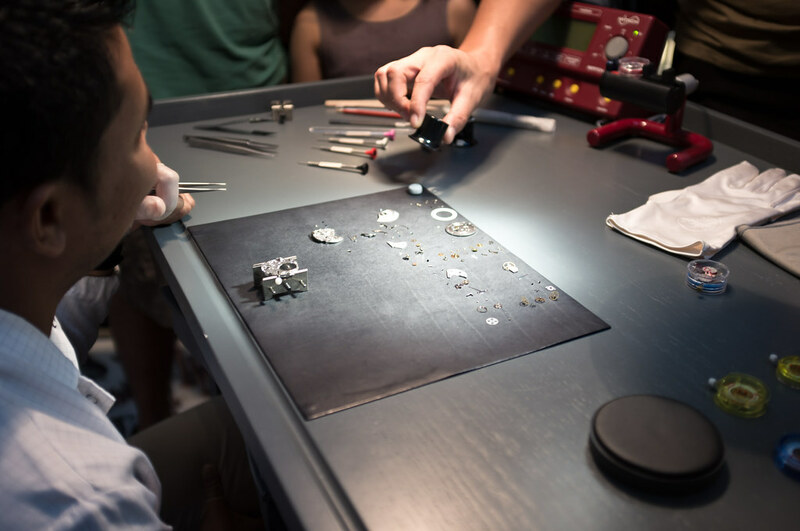 At another booth, a craftsman demonstrates how the Collier de Chien in White Gold with Diamonds is created. Tiny diamonds, finer than a grain of sand, are placed into the white gold pyramids and ring in Pavé setting, to form an exquisite version of Hermès’ most iconic bracelet. The completed pyramid looks like a large dazzling gem, with barely any gold showing. The craftsman was kind enough to invite guests to look through his microscope and I was just amazed at his precision skills. 999 diamonds (total: about 5 carats) are used to complete the most luxurious Collier de Chien and unsurprisingly, the price tag on this baby is USD150,000. If you think this is crazy, there is apparently an ultimate diamond version with diamonds on all the exterior surfaces. Just stay happy with your leather versions, or perhaps invest in the Collier de Chien in Sterling Silver. There is also a watch craftsman, showing the disassembled parts of a mechanical watch. 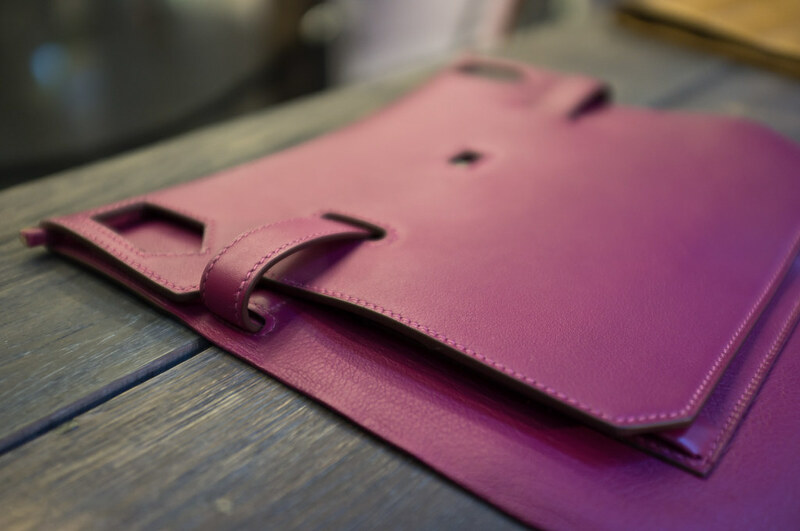 Towards the entrance of the Festival are three leather stations showcasing Hermès’ leather works. 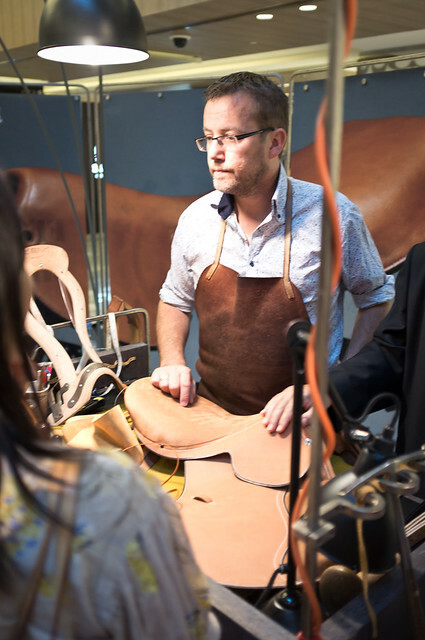 One station focuses on the saddle, while another demonstrates how a leather Bearn wallet is created. There are many leather scraps placed around this area for guests to touch and feel. The last station I visited (which is actually the first station you see) is guests can see pieces of leather transforming into the Jypsiere bag. A young craftswoman demonstrates the saddle stitch technique and surrounding her are shelves of tools, thread spools and leather scraps. One guest actually asked about production and wait-list for the Birkin bag, and the Hermès staff explained that quality leather is increasingly hard to obtain. 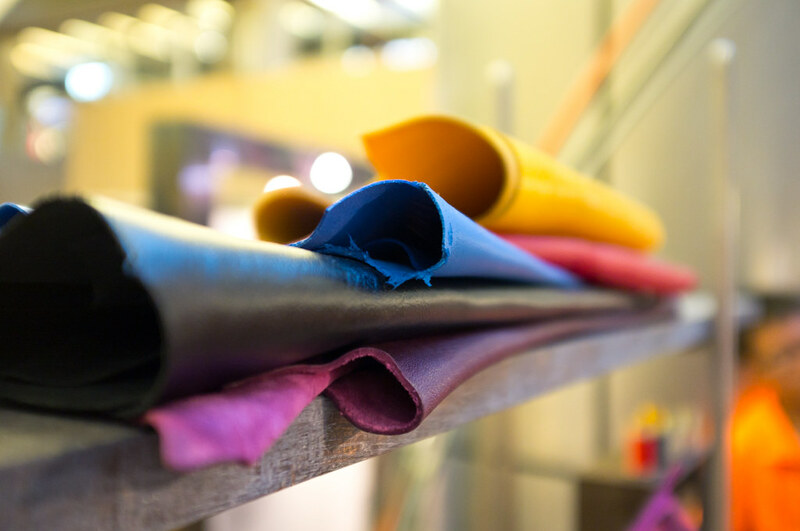 Hermès has very high requirements for leather – nothing but the best. It is a very complicated affair because the most sought-after Birkin bags are created with the rare, exotic hides that are hard to procure – especially when the company demands the best skins and upholds ethical practices. 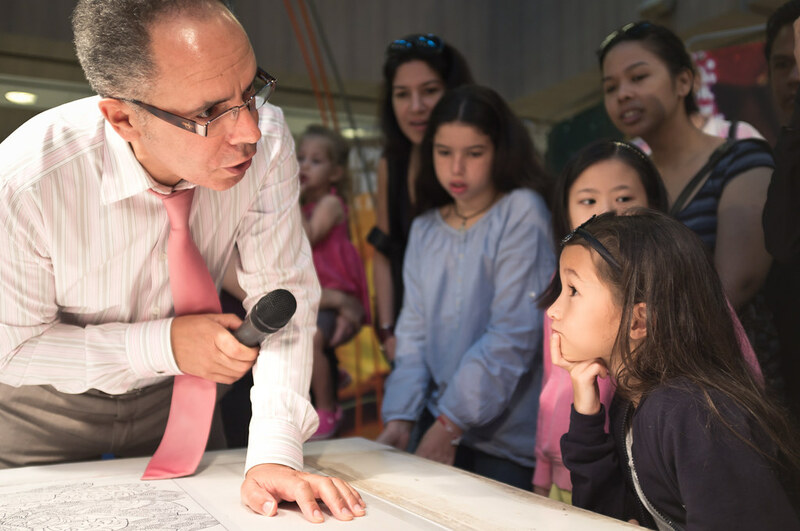 Bear in mind that this is simply an eye-opening, almost educational, presentation on the legendary magic behind Hermès products; it is not a roadshow to buy products. The Hermès staff here will not answer questions on pricing and availability of products on display. You should head to the nearby stores at Ngee Ann City (within Takashimaya) or Liat Towers. The staff at the silk station said that the scarfs created for demonstration will be destroyed and not made for sale, similar to any produced item that fails their quality control. Likewise, any scarf design that is unpopular and does not sell (rare, but it happens, even for Hermès) are regarded as ‘unwanted’ by customers and also, sadly, destroyed. Hermès does not have any outlet stores and their items are sold exclusively in their own stores. I actually have something to share about the way their boutiques operate but that will be another entry. 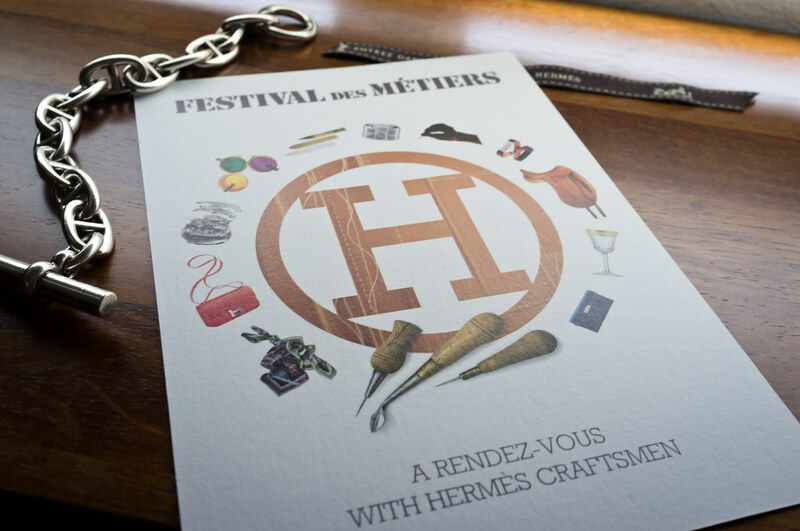 Even if you are not a fan of Hermès, the Festival des Métiers is worth a look. This is a rare chance to meet the deeply passionate Hermès artisans who pour their heart and soul into the products they make. You get to see how exquisite items are made (or more accurately, a small portion). Most of the craftsmen joined the company when they were in the early twenties and stay on until they retire. Their lifelong dedication to handmade items is an amazing thing to even just witness for a short moment. 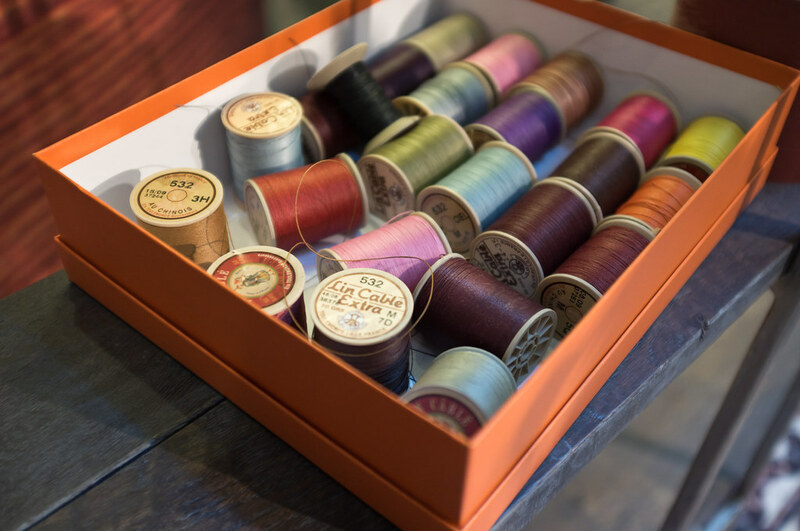 As one of the craftsmen said, their effort and long hours spent making an item is all worth it, once a customer treasures and wears their handiwork. 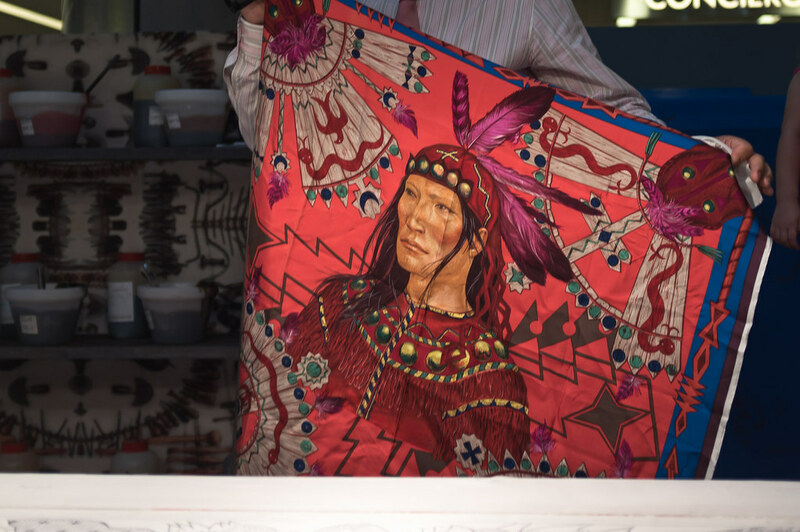 They feel very proud when they hear stories of scarves and bags handed down from generations to generations – an echo to Hermès’ values on excellence and items made to last forever. This is why I deeply treasure the few Hermès items I own – they were made by people who love what they are doing, and they are going to last a lifetime. I am sure that the next Festival in Singapore, if any, will many, many years away. You might have missed school or work for the opening of the H&M store in Singapore but – if you must, you should just do it again before the Festival in Singapore ends this week. 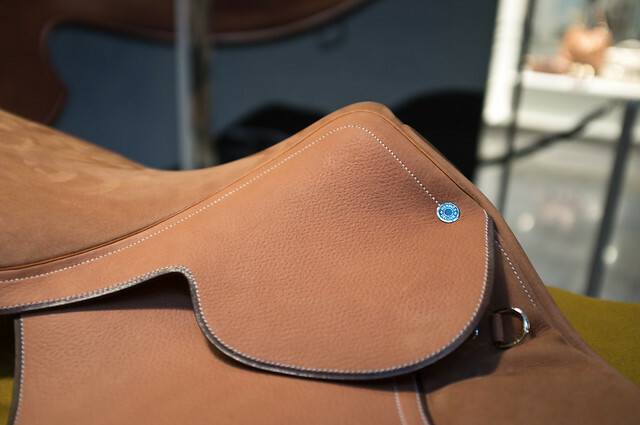 Hermès is one of the few remaining brands that still retains their original values and still produces most (if not all) items with traditional techniques. The festival is open until 7th September 2011. Yep definitely! 😀 I love the pictures you took at the Festival and wow, you got the see the almost-complete Jypsiere! I missed the demonstration at the saddle station (spent so much time at silkscreen printing) – the craftsman was talking about the choice of materials and the processes to make sure that it lasts for a very long time. Be sure to check out the blog posts by The Bag Hag too, she has taken a lot of beautiful, close-up photos! Thank you so much for your beautiful pictures and words. Your sincerity and passion for Hermes are obvious. It was my privilege to attend last year in Washington DC. You wrote a really excellent article! The photos are superb. Thanks for sharing this.